Friends You Are Stuck With is a webcomic about uni, friendship, growing up and all the (mis)adventures that all those things involve, it is placed in a universe populated entirely by animal people. The story follows the life of a group of friends in their twenties. Friends YASW is aimed to be a situational comedy comic, it takes inspiration in tv sitcoms such as How I Met You Mother, Happy Endings, Friends With Better Lives, Will & Grace, New Girl, Master of None and of course Friends (Good shows that you should definitely watch). Also, this comic is heavily inspired in Housepets!, a webcomic that you should check out. 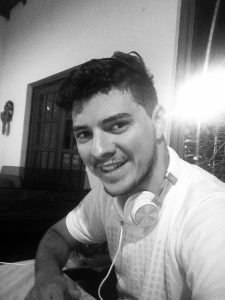 Gabe Bold is a Costa Rican artist in his mid twenties, he is a Software Engineering student. He loves telling stories and in 2013 he thought about a great idea about a comedy involving some characters living together, so he started working on how to make that idea a reality. Since Gabe didn’t know how to draw, he tought himself how to do it. Flashfoward to July 2016, when he decided he was ready to start his own comic and it was then when Gabe started drawing the first strips of Friends You Are Stuck With. Gabe loves sports, you name them: tenis, american fotball, basketball, baseball, golf and specially football (real football). He also practices some of them (that doesn’t mean he’s good at them). He also loves drawing as you can imagine and discovering new artists, new styles and stuff like that. He also wrote this and found it weird to talk in third person. What’s the update schedule ? Twice a week, Mondays and Thursdays. If anything changes, i’ll let you know. Wait, is this a Furry Comic ? Well… It is set in an universe entirely populated by animal people. So, yeah ! you could say it is a Furry Comic. Furries ? Mmmm… Is it Family Friendly ? It is aimed to be a PG-13 story ! I really like Friends YASW, how can I support it ? Well, I would really appreciate it if you could share the comic with people you think might like it ! Share it ! Also, you can comment on it, bookmark it in your favorites, stuff like that ! Do you have a gallery of your art work ? Sure ! You can visit my Deviant Art Page and FurAffinity Profile ! Can I find you on twitter ? The cool kids are on Instagram, are you on IG? How do you make one strip ? How long does it takes ? Here’s my process: First I plan the dialog of the strip, which charactes are gonna appear and what are they gonna say. Once I’m happy with the dialog I divide it in the amount of panels I will use. Then I start thinking about the “camera angles” of each panel, because if the viewer watches the strip and all panels have the same point of view, it can get boring fast. Just then I start sketching the comic via pencil and paper. Once that is done, I ink it, then scan it and finally I digitally color it and tweak it if needs to be tweak. I also put the dialog in this stage. It takes about 6 hours each strip (just the drawing part), I plan to get faster at it. Also, writting (and coming up with) good dialog is extremely difficult. Is Gabe Bold your real name ? Well, Gabriel is indeed my real name. You said you like football, so… Real Madrid or Barcelona ? PS: This comic is dedicated to my family and friends, you are the people I’m Stuck With, you are the inspiration for the stories I create and without your support and help I know this comic wouldn’t be what it is.